Hello everyone! I hope you all will be absolutely fine and having fun. Today, I am going to give an Introduction to BC547. It is basically an NPN bipolar junction transistor (BJT). The word transistor is a combination of two words, transfer and resistor. So, the basic purpose of transistor is transfer of resistance. A transistor is normally used for amplification of current. The larger current at the emitter and collector can be controlled by the small amount of current at the base. 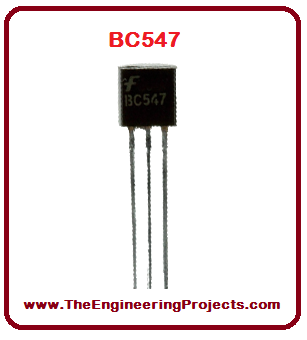 BC547 can be used commonly for amplifiers and switches. Similar to all the other transistors BC547 has also three terminals e.g. collector terminal, base terminal and emitter terminal respectively. The amount of current flowing from base to the emitter controls the amount of the current flowing through the collector. BC547 is usually used for amplification and switching purposes. Its maximum current gain is around 800. 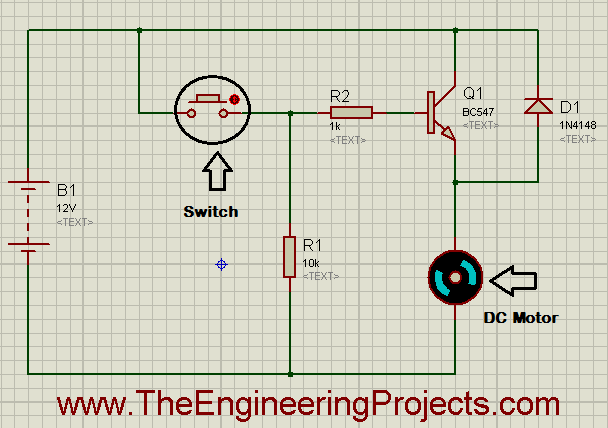 A fixed DC voltage is required for its proper operation in desired region. Proper voltage supply is known as biasing. BC547 is biased in a way that it is partially on for all the applied inputs, for the amplification purpose. The input signal is amplified at the base and then transferred to the emitter. BC547 is an NPN Bipolar Junction Transistor. Mostly it is used for the switching purpose as well as for amplification purposes. Similar to the other transistors BC547 is also used for the amplification of current. The smaller amount of current at the base is used to control the larger amount of currents at collector and emitter as well. Its basic applications are switching and amplification. The transistor, BC 547 is shown in the figure below. BC 547 has three pins in total similar to the other bipolar junction transistors. All of these three pins i.e. 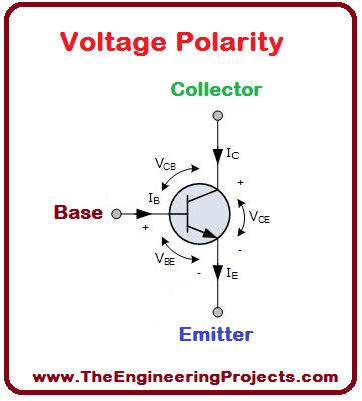 collector, base and emitter along with symbol are shown in the table given below. 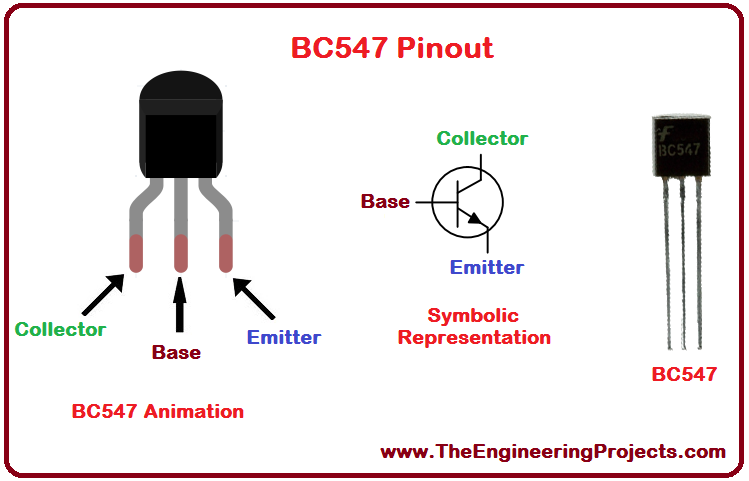 The properly labeled pin configuration diagram of BC 547 along with its animation is shown in the figure given below. From the figure shown above, you can see the properly labeled animation of BC 547, its symbolic representation and the real BC 547 for the better understanding of the user. When the input voltage is applied at its terminal, some amount of current starts to flow from base to the emitter and controls the current at collector. The voltage between the base and the emitter (VBE), is negative at the emitter and positive at the base terminal for its NPN construction. The polarity of voltages applied for each junction is shown in the figure below. The current, power and voltage ratings of BC547 along with their values and System International (SI) units are provided in the table shown below. Moreover, the storage temperature as well as operating temperature for the transistor BC 547 is also given in the table shown above. 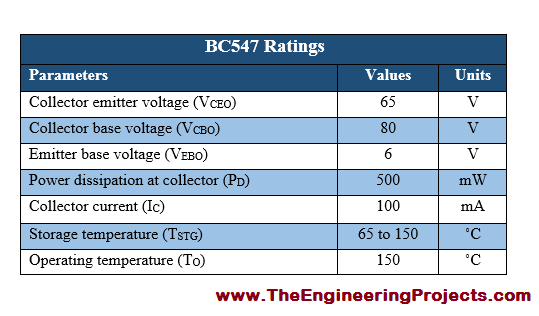 The thermal characteristics associated with BC 547 are provided along with typical values, in the table shown below. There are a lot of applications associated with BC547, a few of the major applications are given below. BC547 can be used for switching purposes. We can also use it for the amplification purposes. 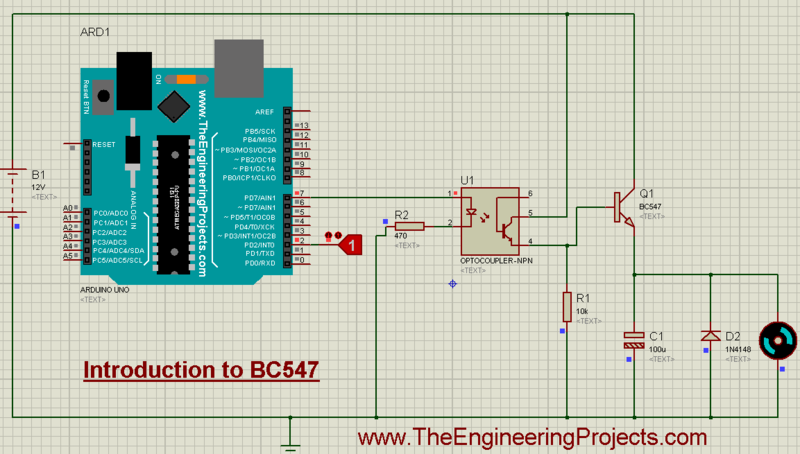 I have made a simple Proteus ISIS simulation using BC 547 for the control of DC motor. The running form of the simulation is shown in the figure below. 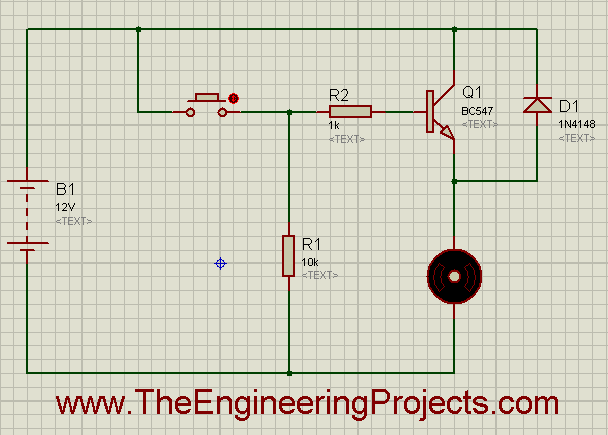 By pressing the button encircled in the figure above, you will be able to observe the working of the DC motor. 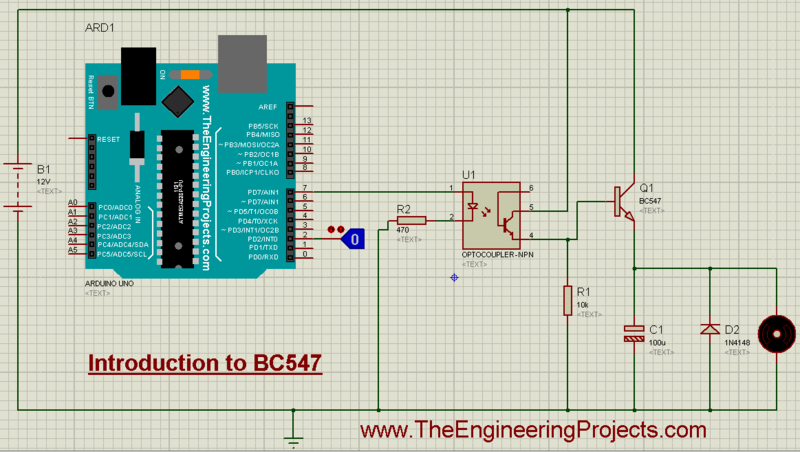 I have made another simulation for DC motor control using Arduino UNO and BC 547. The simulation’s screenshot is shown in the figure below. The source code for the above simulation is given below. First of all, you need to change the logic state from 0 to 1, after uploading hex file, motor will automatically start to rotate.